BCregion = findBoundaryConditions(BCs,RegionType,RegionID) returns boundary condition BCregion assigned to the specified region. Create a PDE model and import a simple block geometry. Plot the geometry displaying the face labels. Set zero Dirichlet conditions on faces 1 and 2 for all equations. On face 3, set the Neumann boundary condition for equation 1 and Dirichlet boundary condition for equations 2 and 3. Set Neumann boundary conditions with opposite signs on faces 5 and 6 for all equations. Check the boundary condition specification on face 1. Check the boundary condition specification on face 3. 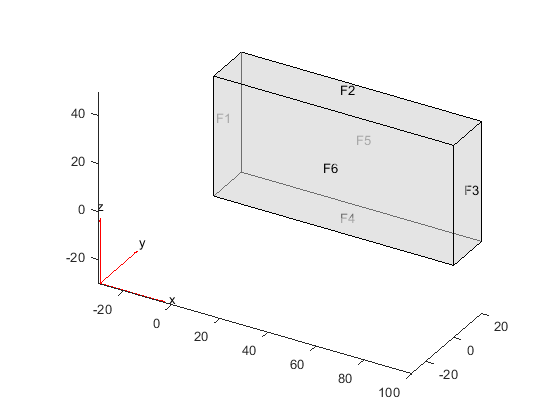 Check the boundary condition specification on face 5. Boundary conditions of a PDE model, specified as the BoundaryConditions property of PDEModel. Boundary condition for a particular region, returned as a BoundaryCondition object.